This entry was posted in Education, HE, Students, University, web and tagged admissions, HE, HEFCE, Students, Unistats, universities by Paul. Bookmark the permalink. 2. Users find the course choice experience so overwhelming that they just run away in confusion/despair/terror. My guess is that there are many reasons, but Unistats probably is not playing as central a role in decision making as its usage stats at first suggest. More research needed! I would query the value of the site, as they say in the report “This would be consistent with a substantial proportion of use by professionals or employees during their working day (whereas other potential users might be able and expected to use the site more uniformly over the week). We infer that a substantial proportion of usage to date has been by careers professionals, others in advisory roles and HE staff, but expect that this balance will change with increasing maturity of the site.” So much of the traffic may not be the target audience of students. For me if it’s not being used by students it has failed in it’s purpose, my understanding is KIS is meant to give students the tools to make an informed choice. The report focused on users who have visited the site and they found it useful, that is good, but by their nature that is a group who have self selected to visit a comparison site they will like comparisons. The key question about the value of KIS is: “Does the bulk prospective student population want to use this kind of thing?” That question appears to be unanswered in the report (with hints saying no). I know from our experience in Newcastle that there has been a heavy burden in aggregating the data and producing it in the desired format. We likely found this easier than others, in that the data was to hand and we have preexisting tools and services to help us, many of our peers will have found it much more onerous. The data format changes this year will again add to the workload associated with KIS. The question for KIS is how much has it cost the sector (i would suggest lots) and what has the benefit been to the target audience (unproven and likely to be low in my view). I was about to make a comment along the lines of Robert’s first point. Unistats won’t usually be the very first place prospective students start looking for information. When they do visit, comparisons can be made relatively quickly. This may be an exercise in confirmation bias, whether or not that’s a good thing. 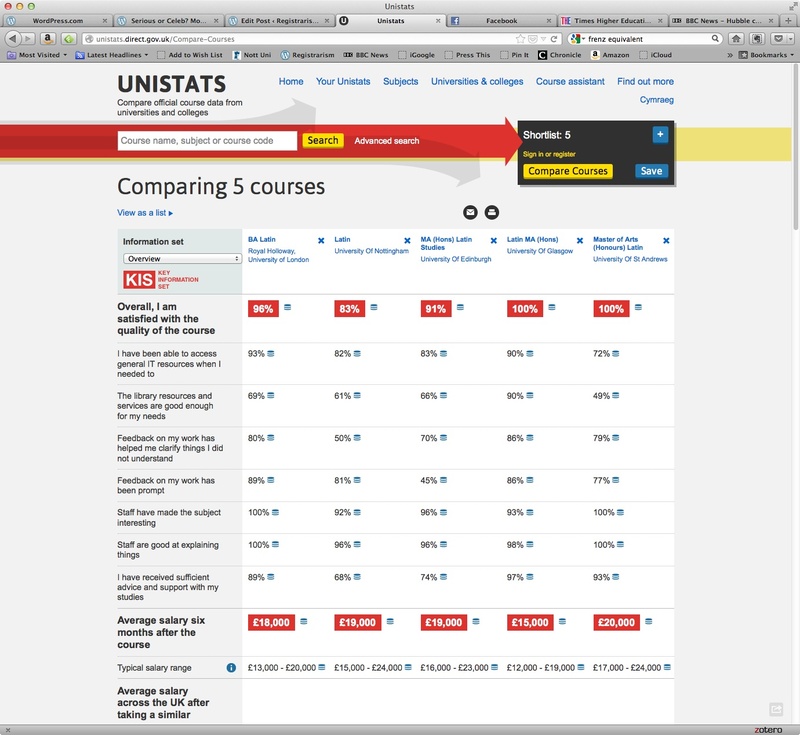 Eight minutes may not sound like much, but when you know what you want to look up, the Unistats site isn’t that difficult to navigate. Comparisons are quick to make too. In addition, have average visits under a minute or so been excluded? I assume many people will make at least one brief visit in order to bookmark or get a vague idea before visiting again to make proper use of the site. It all makes a difference to the averages.